Not so teeny and simple after all? 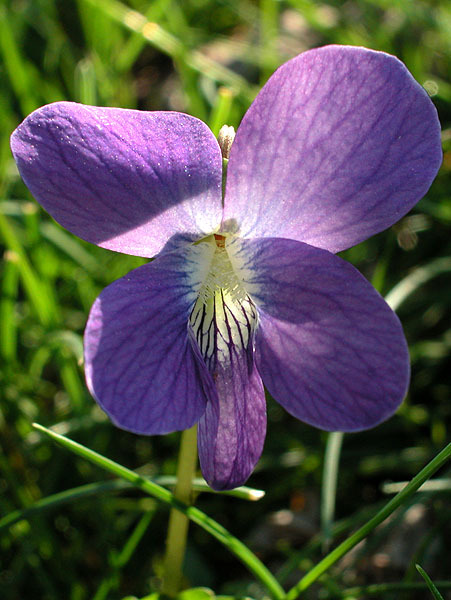 The Common Blue Violet seems to be a simple flower that individuals of all ages can identify. However, for the few who take the time to closely examine this species, they discover the commonly missed details and features that are often overlooked. Because the Common Blue Violet is so small, it has adapted many characteristics to aid in its development. This species has developed colored petals (often blue or violet) and a scent to attract pollinating insects. The blossom has five petals: two upper, two lateral, and one bottom. The upper and lateral pairs act as flags to attract pollinating insects, while the bottom petal serves as a landing strip. These insects are directly guided into to the nectar-containing spur of the flower at the rear of the bottom petal by linear markings called honey guides, which are more visible to the ultraviolet-sensing eyes of bees than to the human eyes. 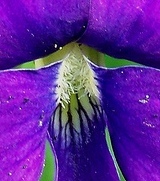 To us they are just decorations, but to the Common Blue Violet, these veins of color play a huge role in reproduction. 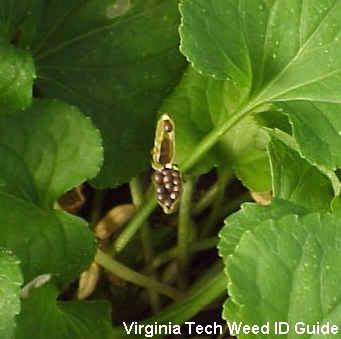 Near the nectar opening are tiny hairs, seen in the picture on the right. This adaptation allows the insect to grab onto something as it pushes its head inside for nectar, but mainly serves the purpose of preventing rain or dew drops from getting in and diluting the nectar, similar to our eyelashes. The development of cleistogamous flowers is another adaptation that enhances the reproduction of Viola sororia. These flowers may appear lower on the plant, under the ground, and often later in the season. They are viewed as self-pollinating buds, pods, or defective flowers that never open or bloom, but contain all the necessary parts to produce fertile seeds. Most flowers of the Common Blue Violet will bloom in early spring when insect pollination does not occur often. In order to make up for this, the species developed cleistogamous flowers that bloom later in the season, since these are self-pollinating. In addition to the numerous adaptations for reproduction, perhaps what truly distinguishes Viola sororia from most flowering plants, is its location of the anthers, which are partly hidden overhead in this species. To find out the reason behind this distinct adaptation, check out the Interactions page. This plant provides food for other organisms, but you might wonder how it gets its own food. Check out the Nutrition page next!